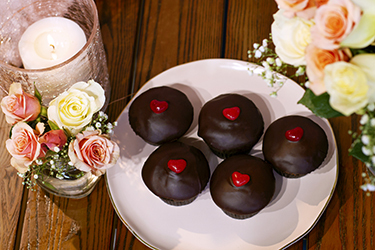 We all know love is in this air this month, so we created some rosy beverages sweetly dressed for the occasion! 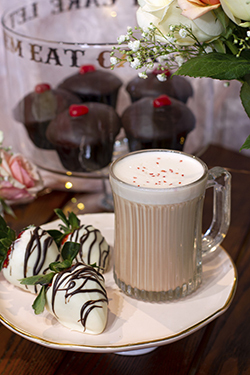 Whether you’re toasting with a valentine, sharing a sip with a gal-entine or decidedly not celebrating anything (we’ve all been there), we’ve created a rich, salty, fruity or creamy brew for you! 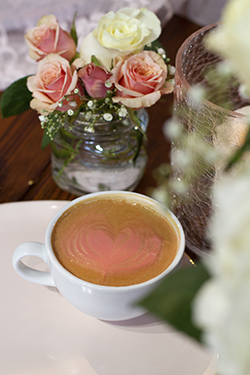 Description: Like the soft touch of a rose, this drink is smooth with a floral hint–perfect for a cold winter morning! Directions: Steep both sachets in the serving cup in 8 oz. of hot water for 4 minutes. In the meantime, steam the almond milk. Finally, pour the syrup over the tea and finish the drink by pouring the almond milk on top. Enjoy! 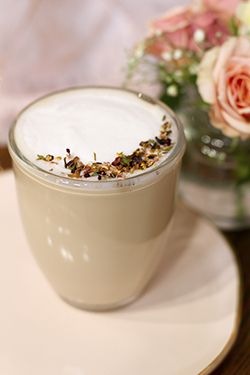 Description: Keep it sweet and simple by taking the earthy, spicy flavor of rooibos chai and sweetening it up with sweet ground white chocolate! Directions: Steam the chai and milk together in a steaming pitcher. Stir in the sweet ground white chocolate and serve. Enjoy! Description: This drink is a nice, light and refreshing lemonade with a little sparkle. Sparkling Lemonade: Pour 4 oz. of Island Rose Premium Lemonade and 20 oz. of water into an iSi Soda Siphon (quart capacity). After firmly attaching the lid and loading a charger, give it a good shake (see the iSi Stainless Steel Soda Siphon Usage Guide & Safety Brochure). Chill to make the lemonade more bubbly. Drink: Rim the top of the serving glass with pink sugar. Fill the glass with ice then add 1 oz. of Monin Tart Cherry Syrup. Top off with the sparkling lemonade. 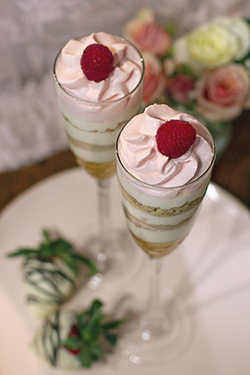 Description: With layers of white chocolate cheesecake, raspberry mousse, and graham cracker crumble, this decadent no-bake treat is easy to make but offers an elegant appeal. Raspberry Mousse: Stir all mousse ingredients together then pour the mixture through the iSi Funnel & Sieve into a Pint Capacity iSi Cream Profi. Seal it according to the iSi Profi Instructions, add a fresh iSi N2O Professional Cream Charger and shake vigorously. Before serving, cool in the refrigerator for a minimum of 6 hours. Cheesecake: Whip the ingredients together and pour the mixture into a piping bag (or you can use a Ziploc bag with the corner cut off). Next, chill the mixture for at least an hour (or until you are ready to serve or assemble the trifles). To Assemble the Trifle: Layer crushed graham crackers and cheesecake (in roughly ½ oz. increments) until the glass in about ¾ full. 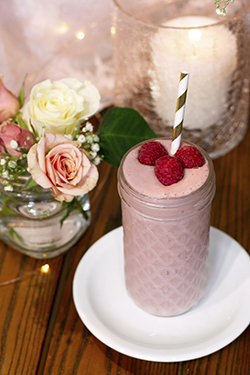 Finally, top the glass with mousse and garnish with fresh raspberries. Serve immediately or store refrigerated for up to 24 hours. Description: Real chocolate covered strawberries out of the budget? Hopefully, this latte isn’t! The classic harmony of rich chocolate and fruit is delivered in this cup. Directions: Scoop one tbsp. of cocoa into the serving cup. Combine the milk and syrup in a steaming pitcher. Prepare and pull a shot of espresso. Then, whisk the espresso and the cocoa together. Next, steam the strawberry milk and pour it over top. Description: Like Butterbeer from Hogsmeade, but with a slight twist, this drink is compliments of Romilda Vane. Directions: Create a drizzle by mixing the white chocolate sauce, french vanilla syrup and charcoal mocha powder, then drizzle it along the inside of the serving cup. 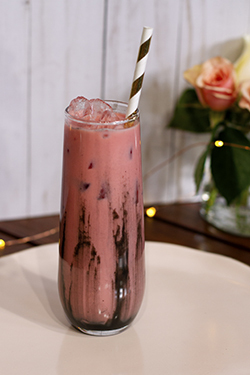 Create the potion by combining the red velvet, English toffee and milk in a pitcher. Add ice to the serving cup, pour in the potion and don’t surprised if you fall in love! 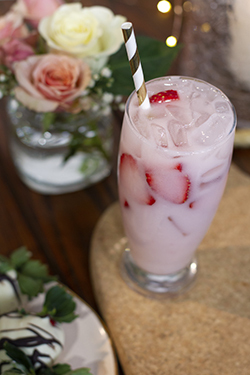 Description: This light and refreshing beverage features the sweet flavors of strawberry acai combined with creamy coconut milk to create a delicious drink that also gives you an added boost of caffeine! Directions: Mix equal parts of the refresher and coconut milk together. Pour over ice and garnish with sliced strawberries! 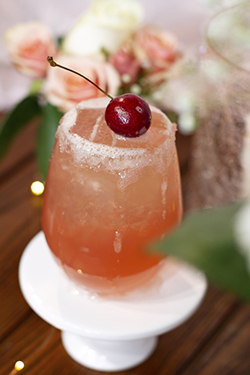 Description: Tart and sweet, this blushing beauty is the perfect treat to share with a valentine or gal-entine on a certain Thursday (... or a good friend on a random Tuesday). Made with an organic, 100% fruit smoothie blend and Organic Madagascar Bourbon Vanilla Creme, this rich frappe is a guilt-free indulgence. Directions: First pour the smoothie blend and Mikadamia into the blending pitcher. Next, add the powder. Finally, fill a 16 oz. cup with ice (to measure about 7 oz. of ice) and add that to the pitcher. Blend everything until smooth and pour it into the serving pitcher. Garnish as desired.